BAK FLIP Fibermax - Complete Vehicle, Inc.
Pickup truck beds have long been jealous of the cab. No matter what you use your truck for the bed just seems to get the short end of the stick. Always getting left out in the rain and foul weather. Constantly under siege from unsavory characters reaching in and snatching whatever they please. Tools tossed about carelessly, sliding and banging and denting anything in their path. Filled with dirt, rocks, yard debris and all of the disorderly detritus that the cab just can't be bothered with. And all the while the valuables are stowed neatly in the warm, dry, safe cab. Cup holders, carpeting, music, heat! The cab gets all the good stuff! But now you can give your truck bed a touch of class, style and added security so it doesn't feel like it's playing second fiddle anymore, thanks to the new BAKFlip FiberMax Tonneau Cover! No other tonneau cover that BAK makes is as strong or as sturdy as the BAKFlip FiberMax. It's custom built from Fiberglass Reinforced Polymer (FRP) on the outside with a solid aluminum core, giving it the perfect blend of rigidity and light weight. The top can hold up to 300lbs of evenly distributed weight. So, it keeps crooks out while creating a stable deck for stacking extra freight. And, BAK uses a revolutionary hinge system that stops the nastiest weather from leaking in. What's more, the BAKFlip FiberMax Tonneau Cover flips all the way up to the inside of your bed, opening up your entire payload when you're hauling oversized gear. Once folded up, it shields your rear window from shifting cargo, and it's padded to protect your paint from scratches. 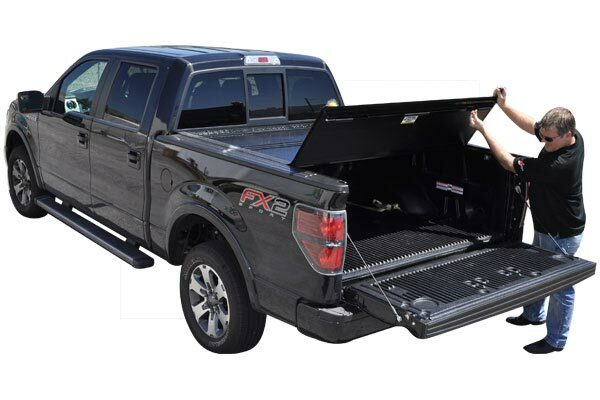 BAK designed the FiberMax Tonneau Cover to work with most bed liners, toolboxes, bed extenders and truck racks, and your truck's stake pocket holes are left exposed to allow the use of numerous accessories. Plus, installation's a cinch, thanks to the integrated rail guides and no-drill mounting (most vehicles). And, BAK backs your FiberMax Tonneau with a 2-year warranty.